While writing that post, I realized I haven’t really written much about dysautonomia so if you’re unfamiliar with the condition you might not really know what I was talking about. As it turns out, it’s a lot harder to provide a brief description of dysautonomia than I thought, at least for someone like me with a tendency to ramble. In an effort to avoid publishing a novella, I’m posting this piece separately for anyone who wants to know more. Okay, so let’s chat a little bit about dysautonomia. Dysautonomia is a fancy word that is unrecognized by any spell check program to describe a dysfunction of the autonomic nervous system (ANS). When you’re thinking about which functions are autonomic, think automatic. The ANS is in control of all of the things that go on in our bodies without us even thinking about them, things like heart rate, blood pressure, digestion, respiratory rate and temperature regulation. You can probably imagine, then, that when this system becomes dysfunctional a lot of chaos can ensue! There are several different subtypes of dysautonomia but there is a lot of overlap between them. Specifically, I have POTS (Postural Orthostatic Tachycardia Syndrome) which as the name implies means that when I’m upright (orthostatic) my heart beats inappropriately fast (tachycardia). That literal explanation, however, makes it sound way more innocuous than it actually is. As for how it feels? It feels rather terrible. If you’re with me when this is happening you will actually see the colour drain out of my face. I get lightheaded, dizzy, nauseous and shaky. Oftentimes I will get this ache in my gut, as if someone punched me in the stomach, and it forces me to bend over. My ears might start ringing, my vision might go blurry, and then there is like this force trying to pull me down to the ground. When your ANS is dysfunctional it’s also really easy to experience sensory overload. Situations that involve a ton of noise, a ton of people or a ton of frenzy can overstimulate the ANS and thus trigger a lot of the symptoms, sort like poking a sleeping bear. Not every day brings vitals quite that wonky, of course, but every day brings symptoms and some days these symptoms make it almost impossible to be a functional human being. You know when you’re recovering from the flu and you just get zapped of energy anytime you try to do anything? After a few days of lying on the couch you decide to get up and be productive, then after 10 minutes you’re exhausted, you feel so sick and you end up back on the couch. It’s like that, except you’ve also just donated blood, you’re dehydrated and you’re being forced to run on the spot. It’s basically as fun as it sounds. There are so many symptoms associated with POTS and dysautonomia and unfortunately they are not just limited to an upright posture. The tricky thing about POTS is that it is not an actual disease, rather it is a syndrome, a cluster of symptoms. For example, if someone is experiencing nausea, heartburn and abdominal pain, there could be any number of things going on and causing that set of symptoms. It’s a similar situation with dysautonomia; there are so many different possible origins, including autoimmune, genetic and viral, and in many cases the cause is idiopathic (which is a fancy medical way of saying “this is what is wrong with you but we have no idea why”). So many patients have multiple health issues which can make it really hard to tease out what exactly is going on. There is no cure for dysautonomia but there are treatments that focus on symptom control. Many of these treatments involve lifestyle modifications but there are also some medications available to help control heart rate and blood pressure. As no two patients are the same, each patient’s management plan might look different. Personally, I am in the middle of trying to figure out the right combination of things that will result in the most improvement with the least amount of side effects. It’s a very fine balance! And there you have it. That’s the best I could do in 800 words, but in case you are more confused now than you were 800 words ago I’m going to leave you with links to some excellent resources! For more information about POTS and dysautonomia, I recommend checking out The Dysautonomia Information Network or Dysautonomia International. And for more information about day to day life with dysautonomia a few of my favourite blogs are Living with Bob, Just Mildly Medicated and Let’s Feel Better. And finally, since the whole purpose of the appendix (or addendum or supplement or whatever) was to help you understand why I sometimes use a wheelchair, let me take you back there now! The panel I linked is pretty much the only lab in to US that tests for AAG due to an exclusive patent. Being ganglionic nicotinic acetylcholine receptor antibody positive plus having symptoms very likely means AAG. I do know a Canadian who has AAG and is antibody negative. She is easy to get ahold of via Twitter. Her Twitter handle is @pillsandpebbles or Twitter.com/pillsandpebbles . My Twitter handle (in case you are wondering) is @wilddiabetic or Twitter.com/wilddiabetic. Have you been tested for autoimmune autonomic ganglionopathy/neuropathy? I have it and only 40-50% of those with AAG test positive for the antibody. I am ganglionic nicotinic acetylcholine receptor antibody positive. It’s a treatable form of dysautonomia. 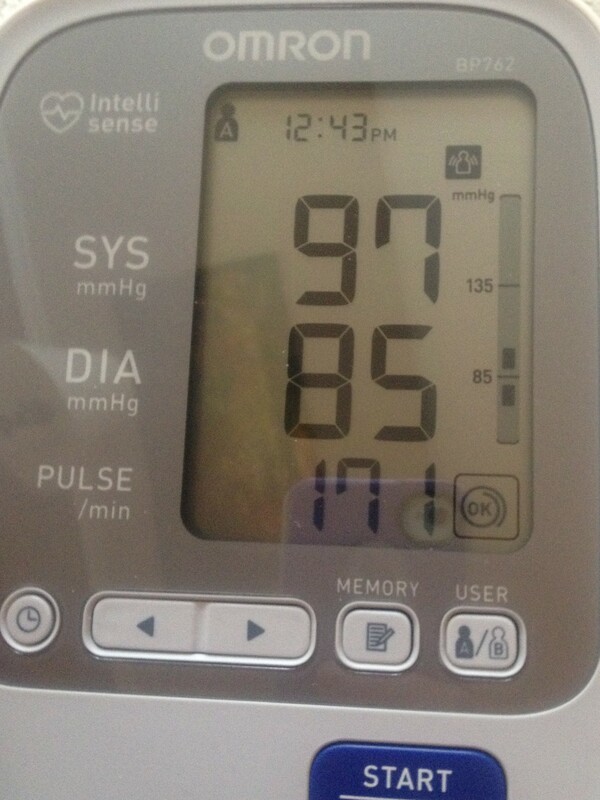 Additionally you cannot have both POTS and orthostatic hypotension, which it appears you might have based on the blood pressure reading photos. The reason why somebody with orthostatic hypotension has POTS like symptoms is because the heart will beat significantly faster to try to raise blood pressure, even if failing to a certain degree. You really can’t have both and it looks like orthostatic hypotension to me. 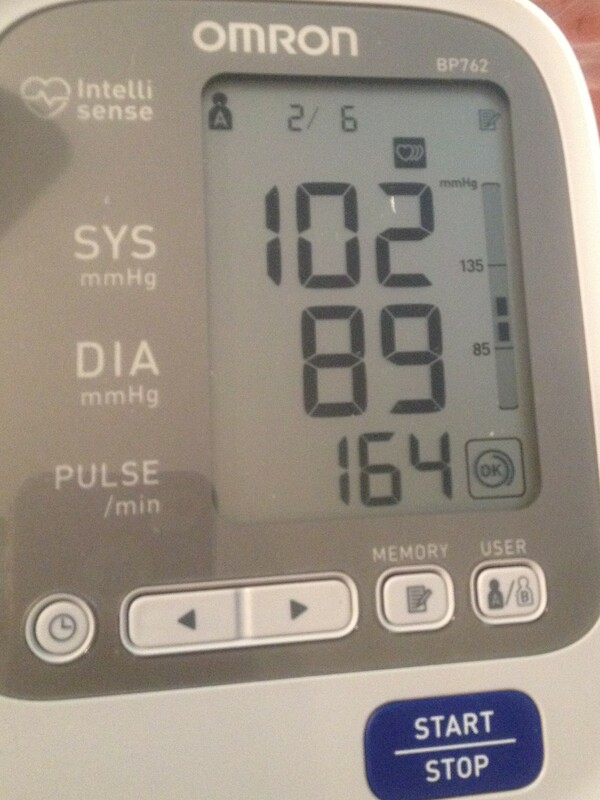 My cardiologist told me I don’t have POTS but I do have orthostatic hypotension. I have had several ANA panel and an ENA panel run for general autoimmune conditions, but I’m not sure if that would also cover the testing for AAG. I did mention a possible autoimmune cause to my cardiologist but he didn’t seem to know too much about it. I know that some tests are much harder to get, or even non-existent in Canada, so I’m not sure how to go about that. Very interesting about the not being able to have POTS and OH thing. I’m not sure if it’s because dysautonomia knowledge and awareness is relatively new in medicine and as a result there is a lot of confusion about it, but I’ve come across so much conflicting information about this! Some say that you can have both, and some say that one is just a result of the other. 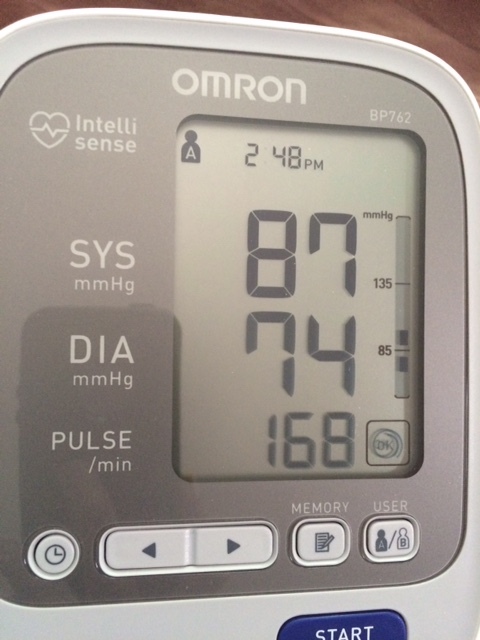 When I say that my blood pressure drops when I stand up, it’s actually more my pulse pressure that drops. My resting BP could be 90/55 and then my upright could be 90/75…so my systolic isn’t dropping and my diastolic is going up. Most of the time one or both readings go up, and it’s the difference between the two that drops. From what I understand that’s pretty common in POTS, but again, it can get pretty confusing trying to untangle all the different types and symptoms of dysautonomia! Anyway, thanks for the comment and the information and I’ll definitely look into AAG a little more. Hope you’re hanging in! I hope to read more about your life. I too have postural issues and need a wheelchair an awful lot! Hi Angela – I’m pleased that you found me because now I get to be pleased to have found you! First of all, I love that you’ve got so much going on with your health but that you’re not letting it take over your life. I also especially love that you have an obsession with home storage solutions and anytime you are in Vancouver please come visit me so you can organize my yarn addiction. I’m really close with my own sister (who happens to be married to a photography loving star wars geek!) and I think it’s really neat how you and your sister have joined forces. You’ve got the patient perspective, the doctor perspective, the parent perspective (of 1 and 6 kids!) and that’s really cool to see. Oh, and here in Canada we have a public health care system as well so I SO feel you on the wait times. It can definitely be hard. Anyway, thanks for stopping by and I’m definitely looking forward to perusing through your blog a little more.